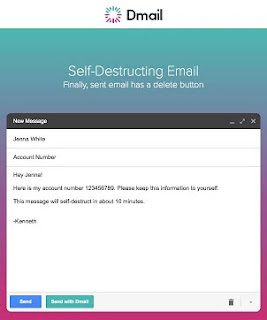 Dmail is a brand new Google Chrome extension that gives the author complete control over how long the recipient of your email can view the email. It adds a "Send with Dmail" button next to the regular "Send" button in any email you compose (after you have installed it). Gmail allows you to cancel emails within a 30 second window. After that, you're out of luck! With Dmail you can chose a predetermined time frame, or pick "never" as your time frame. Then you have to find the email in your send folder and then retract it. More exciting news is that Dmail has promised they are working on a new feature (not yet released) that allows you to lock your email so the recipient can't forward it on to anyone else. For businesses and education clients this plugin has the potential to be huge!! Gotta love this open source stuff! !